I know this may seem like an odd selection for a recipe post just a few days before Christmas. It’s not holiday specific and it doesn’t contain peppermint, molasses or ginger, or any other Christmasy baking ingredient that is usually expected this time of year. What you have here is a tasty little party dessert that covers all your festive baking bases. Almond paste is the dominant flavor in the crust, which then accents the rich chocolate ganache filling. But lets not forget the meringue. 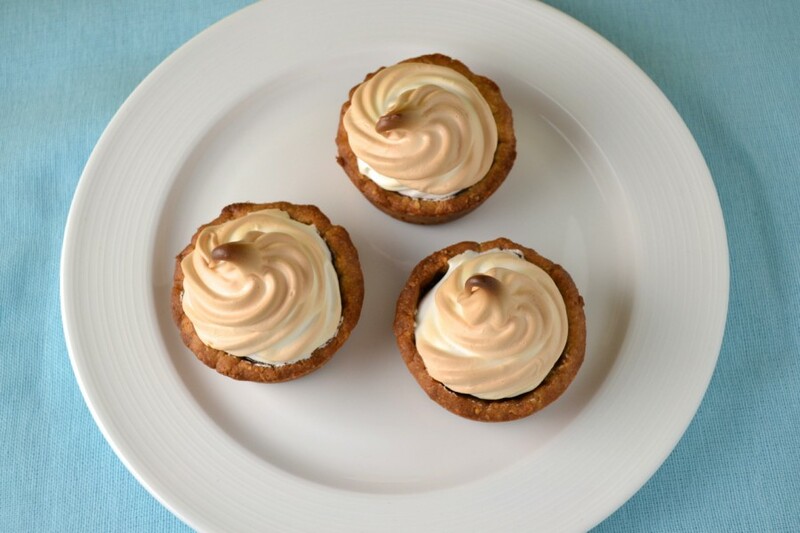 These lovely white peaks are the finishing touch that brings all of the components together into one delicious mini dessert. I developed this recipe solely based on inspiration. It is not a Paula Peck recipe nor one from her colleagues. I happen to try a version of these little delights at an Italian Bakery in New Jersey that I often frequent. A chocolate tart with an almond flavored crust seemed brilliant to me and I’m always a sucker for meringue. I had seen the recipe for Almond Short Pastry in my grandmother’s book , “The Art of Fine Baking,” and the use of both ground almonds and almond paste convinced me it would make the perfect tart dough. The richness of the hard cooked egg yolks (one of her best tart-making techniques) combined with the nutty almond pairs beautifully with the chocolate filling. The meringue may be over kill but it definitely gives these tartlets the snowy-peak feel appropriate for holiday entertaining. Besides, who can resist the pillowy white marshmallow texture on top of almond chocolaty morsels of magic? Cream almond paste with raw egg yolks until soft. Place almonds in a food processor and pulse until finely ground. Mix flour and ground almonds together and place in a bowl, making a well in the center. In the well, place sugar, salt, lemon zest, softened butter, spices, hard boiled egg yolk, and almond-paste mixture. With finger tips, combine the center ingredients, gradually incorporating flour and nuts to make a smooth, firm ball of dough. Chill until firm enough to roll between sheets of wax paper (about 1 hour). Roll out dough 1/4 inch thick. Using a 3 inch round cookie cutter or top of a glass, cut out rounds of dough and gently place them in muffin tin, lightly pressing down to line each cup. Chill for 30 minutes. Meanwhile preheat oven to 350 degrees. Bake 15-20 minutes or until just barely beginning to lightly brown. Half way through baking, prick centers of cups so they do not continue to puff up. Allow to fully cool. Heat the heavy cream and milk in a pot over medium-low until it simmering slightly. Remove from the heat; add the chocolate and stir until melted and smooth. Add the sugar and salt and whisk until well incorporated. Beat the eggs and add them to the chocolate mixture, stir until completely combined. Pour the filling into the cooled tartlets and bake at 325 degrees for 15 minutes until the filling is set and the surface is glossy. Cool completely. Place egg whites, sugar, and cream of tartar in the heatproof bowl. Set over a saucepan with simmering water. Whisk constantly until sugar is dissolved and whites are warm to the touch. Transfer bowl to electric mixer fitted with the whisk attachment. Beat, starting on low speed, gradually increasing to high, until stiff, glossy peaks form, 5 to 7 minutes. Add vanilla, and mix until combined. Pipe mixture onto tartlets. 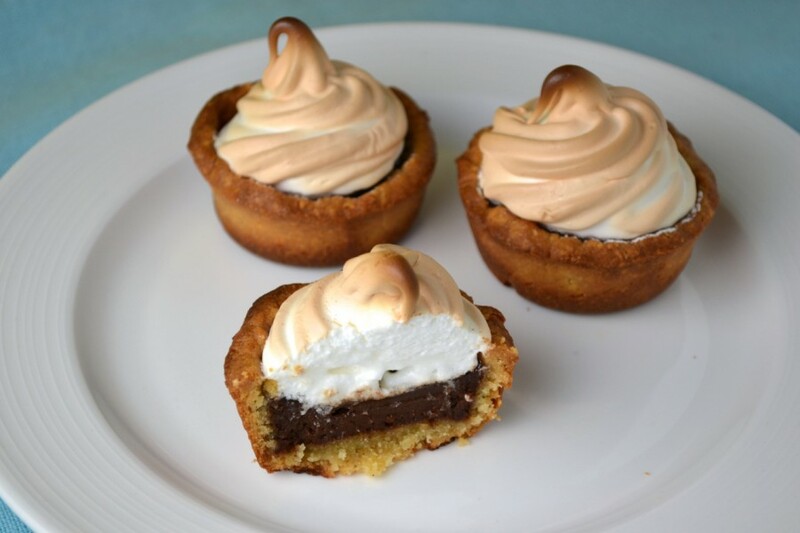 Raise oven heat to 350 and place tartlets in oven, until meringue is golden (about 5-10 minutes). Cool. Yield about 12 mini tarts.